If you look closely, you will notice that bees and wasps are far different from each other with respect to their physical appearance. Wasps, like hornets and yellow jackets, have a thin body that narrows at their waist. Bees, on the other hand, have plump and healthy bodies. The body of wasps has a nice smooth and silky texture, whereas the body of bees is quite hairy and rough. Whey they fly, wasps hang their back legs, while bees don’t do that. On the bees, you can notice a pollen basket in their back legs. This is not visible on wasps. Though bees and wasps are known for their sting, you should know an important difference between their stinging nature. Wasps are capable of stinging humans multiple times. Their sting is more powerful and painful than the sting caused by the bees. Bees sting humans only once. They die after this because their stinger is barbed on their body. After a sting, the stinger gradually falls off from a bee’s body, causing it to die. Bees and wasps are quite different from each other when it comes to the foods they eat. Bees are less aggressive, and they are content with foods such as pollen, nectar from the flowers and food leftovers. On the contrary, wasps are not only aggressive but carnivorous eaters as well. They feed on other insects and their own young ones as well! They feed on subtle foods such as nectar and pollen only when they become adults. Bees reside in vertical combs that they create out of wax. Sometimes, they also live inside the cavities found on trees. 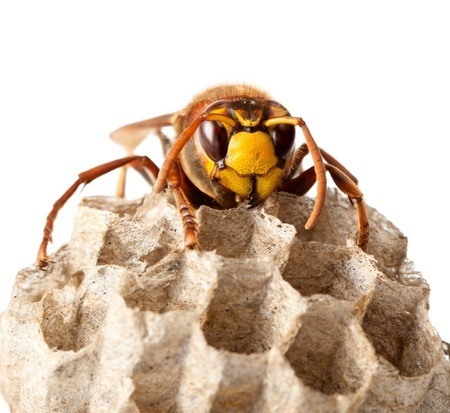 The homes of wasps are more like a pulp because the wasps create it with their chewed wood fiber and saliva. Bees live in large numbers in their combs. You will find close to 75000 bees in a colony at any given point of time. However, you can find only a maximum of around 10000 wasps at a time in their home. You can also differentiate between bees and wasps depending on their ability to adapt to cold conditions. Bees can hide wherever it is warm and build their colonies there. Therefore, it is very easy for them to survive cold climates. They can remain hidden in their combs for even a year, without any problems. However, wasps cannot survive in extremely cold conditions. They come out in the open to feed on sweets and food during this time, and they eventually die as they cannot withstand the extreme cold.